One summer, I organized a vacation with friends in a place where we only see at books during our elementary days. There was no denying of such excitement. But what awaits us in the said place is indeed history in the making. That place is the Banaue Rice Terraces of Ifugao Province, declared as the Eighth Wonder of the World. With the said declaration, I have no idea if it's official or a mere tagline. Through research and by the so-called ocular inspection itself, I have learned that there is a misconception on what I have always believed, particularly the belief that Banaue Rice Terraces is a unesco world heritage sight. By walking through the numerous rice fields, you will learn that only those in Batad, Bangaan, Mayoyao, Hungduan and Nagacadan, all in Ifugao are inscribed as UNESCO World Heritage Site and that other banaue rice terraces are not, but considered as National Culture Treasure. 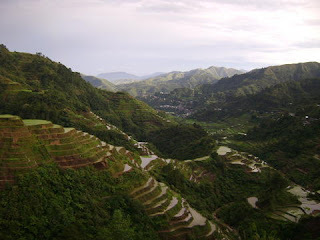 We were able to visit Hungduan and of course, the unforgettable Batad Rice Terraces. 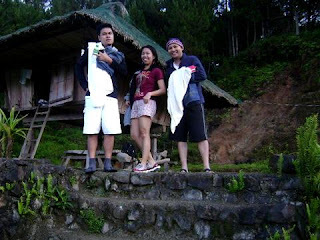 Witnessing the grandeur of the said terraces carved in the mountains of Ifugao is not that easy. It takesm perseverance and strength to be able to finish the very long walk. Remember, once the trail starts, there's definitely no turning back. There's no helicopter or chopper to fetch you up on the mountains. Let me start the adventure by sharing to you where we stayed. 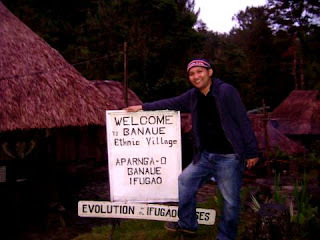 From the choices that were laid down, we chose the Banaue Ethnic Village and Pine Forest Resort, to experience primitive living. And by primitive, means staying in cottages with the forest that surrounds and the very cold atmosphere. There were swimming pools in the said resort but who would dare to swim when the weather was freezing. Within the said resort, there is also a display of Ifugao primitive houses which serves as a showroom as well known as the Banaue Ethnic Village. For our first day, we visited the various rice terraces in the province and we were warned to be relaxed and comfortable, as there is something to reserve our energy for on the following day. Honestly, just like any warning I didn't take it seriously. Sightseeing and picture-taking are the activities for the day, and entails a long walk as well. Thus, the walking started and as warned, this is just a warm-up for the following day. I wonder what is really in store for the next day. The day tour then ended. Some of my friends did not eat dinner as they were so tired and opted to sleep early and prepare for the big event the following day. The second day I should say is one of my most unforgettable travel adventures. First, I was not equipped with the proper attire. But at least my tsinelas (slippers) served me well. First stop was the Bangaan rice terraces. Then we proceeded to the Batad Rice Terraces, the highlight of the never ending walk to the best rice fields in the country. While walking, I was thinking if this was all worth-it, every scenery was the same...they are all rice fields. But what makes Batad rice terraces extra special is something to unveil. The itinerary says it should be a two-hour hike to the village, terraces and the waterfalls. But in our case, it was more than that. I'd rather not disclose how many hours we went through this hike, but just for your information we are not official mountaineers and strong hikers. My friends love to hike but speaking for myself, I don't love it but I also don't hate it...it's an activity I take for the sake of adventure and meeting new friends along the way. Looking at the pictures I kept wondering why I wore jeans, as if I'm strolling in a mall. (hahaha!) Mind you, the next scenes is definitely not a walk in the park. We dropped by at Simons Place, where food is bearable and of course, we have to rejuvenate, so we have to drink water and eat as much as we can. There are no shortcuts. And so, the trail must be finished whether you like it or not. The way to the Tappiyah Falls is a challenge. I don't know how many mountains we have passed just to go there. And just imagine we have to go back and follow the same trail all over again. We were pressed for time in going back as we still plunged into the water falls to give ourselves a treat. But then, we were warned that we have to go back soon as rain may pour so hard and it's harder to go back. True enough, we were caught by the rain. And the rest is history. What matters most is, we survived the never ending walk to the best rice fields in the country. The experience was all worth it, but it shall be the first and the last for me. I can recommend it for friends who would like to experience it but expect the unexpected. village, terraces and water falls. This is recomended for strong hikers. I am not sure if I have given all the information you need but you are welcome to communicate for verifications and other inquiries! ACCT. NO. 00-627-810020-9 in the name of ANDRES DUNUAN. Many thanks! For this, thanks to my highschool friends and their friends, UP classmates, schoolmates and the SGV friends for the company and to the Buyao Family, especially to Ms. Jane for making us experience and witness another site that our country should be proud of. Some photos are courtesy of Ms. Michelle Almenario and Ms. Felina Ocubillo. 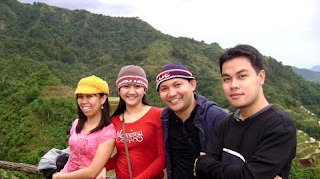 I was wondering if you would be able to let me know what tour guide you went with during your trek through Banaue, Batad, and Sagada. If you could give me any type of contact information it would be very appreciated. 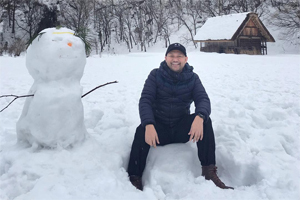 I'm with one other person and we would be very interested in doing a multi-day trek through the rice-terrices, however your post mentions a 12-person group. Is this something that we can book and expect to have 10 others also be booked with us? Also, I'm curious if the P1,950.00 that you added in your itinerary was the total you payed with the accommodations, breakfast and the tour guide for the entire trip? Or was the this the charge per day.